Rentals at the Maui Eldorado are steps away from the Royal Ka'anapali Golf Club. 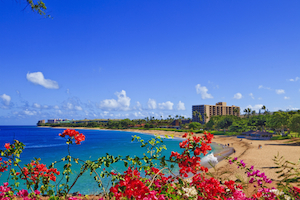 Stroll from the Lahaina resort to the calmer side of Black Rock on Ka'anapali Beach. All the shopping and dining of Whalers Village is just a 10-minute walk away. Select your lounge chair and sit back in the sun. You're surrounded by Ka'anapali Golf Course. The Maui Eldorado Kaanapali by Outrigger is located next to the Royal Kaanapali Golf Course, a ten-minute walk to the beach and Whalers Village in Lahaina. Ready to get your swim on? You’re in luck! The main highlight of the resort: the three outdoor pools. Pick one or alternate through all three. Swim laps or lounge poolside and keep an eye on the kids. When it’s time for lunch, fire up the poolside bbq grills for a family cookout. Let the little ones help carry burgers and hot dogs while the grownups carry plates, condiments, and buns. After lunch, head across the street to Valley Isle fitness center (located at the Fairway Shops). They are open seven days a week, have visitor passes available for purchase and offer treadmills, ellipticals and stepping machines. The fitness center also has childcare so your little ones will be occupied while you’re getting your cardio on. Reward yourself for a great workout with a visit to Spa Maui & Massage for a deep tissue or hot stone massage, facial or body treatment. They even offer treatments for sunburns. Back at the resort, grab your beach gear and have the family head to Maui Eldorado’s private beach cabana. It features bathrooms, showers, lounge chairs and even a full kitchen. The studio, one- and two-bedroom condos sleep two to six guests, are individually owned and decorated, and exceptionally spacious with garden or partial ocean views. Bring the family along on the short drive to Times supermarket to stock your full kitchen. Bake a batch of your chocolate fudge brownies and let the kids help with the mixing. Don’t worry if they end up covered in chocolate; that’s why you have an in-suite washer/dryer. Enjoy the brownies while you watch a sitcom rerun on the flat screen tv with cable. When you come back to your condo after a day of fun in the sun, have a family movie night thanks to the DVD player. Bring favorite movies from home and gather everyone on the couch with the brownies (if there any left) and popcorn. Maui Eldorado is next to Royal Kaanapali Golf Course. This Robert Trent Jones Senior-designed course opened in 1962. It’s an eighteen-hole, par 71 course that underwent a thirteen-million-dollar renovation between 2006 and 2007. It’s known for hosting several golf legends including Nancy Lopez, Arnold Palmer, and Billy Casper. To get around town, take advantage of the free area shuttle, it runs every twenty minutes. Whalers Village is an outdoor shopping mall with stores ranging from moderately-priced to high-end. First stop: Island Vintage Coffee for a delicious latte. Now that you’ve had your caffeine, it’s time for serious retail therapy. If you’re looking for a new handbag, there’s Kate Spade and Louis Vuitton. Pick up a new pair of shades at Sunglass Hut. Treat yourself to a new piece of jewelry from Maui Divers, Pandora or Alex and Ani. Hungry? Try Leilani’s on the Beach, Nikki’s Pizza or Joey’s Kitchen. Get in touch with your inner daredevil at Skyline EcoAdventure, Hawaii’s #1 Zipline Company. You’ll have five zipline adventures to choose from. HOUSEKEEPING There's No Cleaning Service During Your Stay. Optional Housekeeping Services Are Available For A Cost. - The front desk is open 6:00 AM - 10:00 PM daily. Guests that arrive outside of normal front desk hours must contact the property in advance using information on the booking confirmation.